Despite my stated love for cool colors, and ocean colors, I had not realized what a rut I was in. Don't get me wrong, nothing will stop me from thinking that blues and greens are awesome and flattering and pretty, but I may consider making an effort to expand my color repertoire. (My purchased wardrobe demonstrates better range). I brought two projects with me on my short trip. Both new, in part because I had reached a crucial point with another that was already cast on that was going to make it a bad traveler and because I had pretty, pretty yarn! 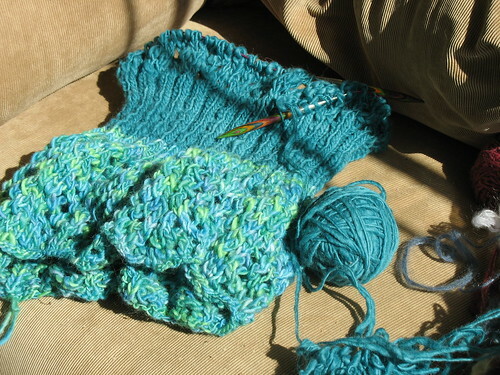 The bottom bit is knit on big needles so the visible progress is really rewarding. And I love that most of the shaping is done by switching to smaller needles for ribbing. The only snag I see up ahead is sleeves. I still don't like them. But maybe big lacy sleeves will be more fun. I started off thinking I could cheat on the sleeves, make them smaller or something, but I think the proportions would look funny with little sleeves. But that's a while. I love this pattern. Can't wait to see your FO.